My name is Kathy B, and I absolutely love Christmas. I am a glittery tinsel bandit and an absolute festive junkie, and I love the optimism, jolliness, and general sense of magic that accompanies this time of year. Galloping around the house terrorising my neighbours with my atrocious rendition of 'all I want for Christmas'? Eating my weight in turkey and cranberry sandwiches? Having a few too many glasses of wine and dawdling under the mistletoe like a yuletide desperado? Yup, Christmas is my absolute forte. In fact, if it didn't already exist, I'd have gone and bloody invented it anyway. Ding dong merrily on high; the works. You're welcome, world. As tradition informs me, this is the time of year where all us Santa-loving folk (aka everybody under 9, and me), get scrawling to you with a list of all of the wonderful things that we hope to find under our tree this year. Once upon a fine time in my life, before a mound of breast erupted upon my dwarf-like frame, I used to attack the Argos catalogue with a red crayon of desire, a crazed expression on my face, circling 75% of the contents. Now, over a decade on, I can't remember the last time I flicked through an Argos catalogue, and the wish list is heavily dwindling. Bloody norah, is this the first sign of maturity? Will I be sprouting greys soon? Gulp. The moral of this story is that I don't need much from you at all this year. I'm not the kind of person that needs a lot to get by anyway; in fact I'm fairly happy as long as I can write, and as long as I have the night sky, the sea, a bunch of interesting chum-folk, and a daily fit of hysterical laughter. Oh, I do enjoy a hearty chucklefest. However, if you're feeling generous (you're definitely feeling generous), and would like to reward me for being such a kind-hearted, witty human being who brings so much joy to this world (am I pushing my luck? ), there are of course a few things that wouldn't go amiss. So here goes Father C; the Kathy B Christmas wishlist, short and sweet, just like me. (Okay, I'm definitely pushing my luck now). A bit of festive romance. 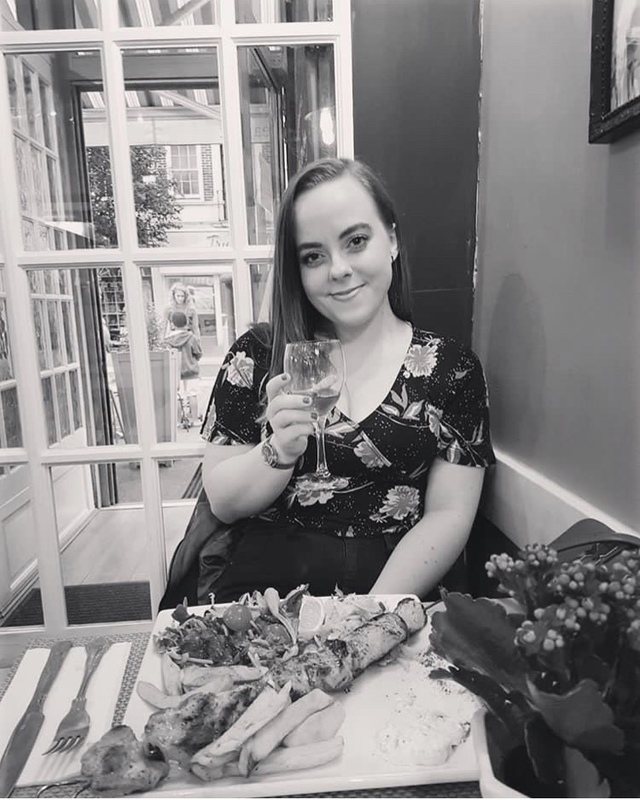 If you've read my previous blog post, you'll know that I've been feeling a little, well, single, which is perfectly fine at every other time of year, but a tad disheartening at Christmas. In light of recent events, please don't send a super awesome man into my life only for a case of 'bad timing' to royally screw things over. Nope, I definitely don't want to have feelings for anyone any time soon. I would however appreciate a romantic 'moment', if you will. Could I perhaps steal a cheeky smooch with a Sherlock Holmes type under the mistletoe? Could I perhaps, receive a beautiful bunch of flowers in the post? Could you bring me an overtly saucy dream about Channing Tatum, or better still, could you arrange for a very naked Channing Tatum to pop by for a spot of Christmas lunch? Pretty please? A third arm. This may sound a tad peculiar, but recently I've been finding myself thinking about how glorious it would be if I could sprout a third arm, particularly if the hand of said arm could cover the radius of one's back. I could carry at least 3 more bags full of dusty, antique books, and I could scratch my own back. It would be bloody marvellous! A trip to space. I am fascinated by planets/the universe/stars. Every night without fail I find myself gazing up into the sky, completely baffled by its spectacularity. I don't think I've ever seen anything more beautiful. I think I'd make a brilliant astronaut Father C. I would love you to the moon and back if you could sort out a little weekend trip for me. And if space travel isn't quite in your remit, please could you at least bring me an adequate level of telescopic skill? So far, when attempting to be all clever and scientific with my scope, I've managed to see nothing but the washing line or the guttering on the side of my house. Astronomical uselessness. Legal permission to stroll around naked in the summer. Whilst I'm more than happy to wear a zillion layers in winter (I will forever love oversized jumpers, dorky scarves and knitted socks), it seems like such a chore having to dress myself once that devilish sunshine starts peering through the clouds. Short summer dresses make me look like a baby walrus, maxi dresses make me look about 2ft tall, and my feet are so small/chubby/duck-like, that beautiful sandals only draw unwanted attention to the monstrosity that is me, from the ankles down. Come on Santa, let's become full time summer nudists. A little more self belief. Whilst I'm perfectly confident when it comes to chinwagging with strangers, throwing hideous shapes for no apparent reason whatsoever, or standing on tables and telling party guests that my control pants are restricting my lung function, I lack a little confidence when it comes to the pursuit of my biggest dreams. It's not that I don't think I can achieve them; it's just that when the inevitable setbacks occur, I shy away from it all for a while, convinced that I'm completely deluded and a total failure. I don't want to feel like that again. It's futile. Sort it out Santa! 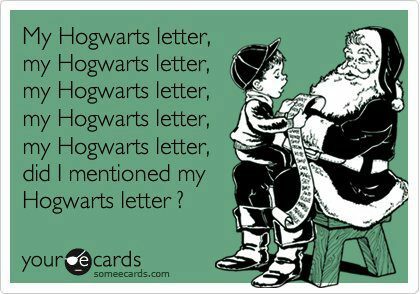 My Hogwarts letter. I've got a lot of time for those wizardly folk. A few months ago I went to a party as 'Kathy Potter', and I was so over-excited by the whole event that I slept in my Gryffindor robe and wore my scar with pride for an entire, hungover Sunday. I quite fancy myself as one of those wizardly folk. Muchos gracias, you fine man. I do hope you have a cracking Christmas, and I shall look forward to seeing what delights are waiting for me under the tree on Christmas morning. PS: I like your beard. It's an impressive mass of hairy goodness; an exceptionally impressive mass of hairy goodness indeed.